Just got back from an 800 mile quest for the city of gold...I mean, After 800 miles of trekking across the tundra, mile after mile...errrr ummm....800 miles in a Toyota Yaris is both good and bad! Yeah, that's it, good AND bad! Like Christmas (which is good), but it includes FRUIT CAKE (which is bad). In truth, the rental car Yaris took us round trip 800 miles mostly on Interstate from Virginia Beach to Columbia SC and back, including the passing of the infamous South of the Border on the SC-NC line. No, we did not stop at SOTB in either direction, and thereby maintained my perfect record of NEVER stopping there! Now maybe if it was a classy tourist trap, like ALLIGATOR FARM, or ROCK CITY, or FIVE HEADED WILDEBEAST I'd stop, but South of the Border isn't on my dream list. So back to the Yaris. Toyota's smallest car, this one was a rental dream! Yes, it was automatic, but it also had roll up windows (by hand crank like in ye olde days). It had air conditioning, but not cruise control. Right now, I'm willing to state that any car without cruise control, especially on the Interstate highway is NOT something I'd wish on anyone, unless that anyone was an alien being invading the planet earth. While we're talking about highway driving, the car averaged around 29-30mpg. That's a little 4 cylinder car with two passengers, medium luggage, and highway miles, no more than 30. I'll have to conclude that mileage, comfort, ease of audio system use, and many other features, it made my FIAT look like a 25th Century transportation dream come true! Sure, the world needs some basic, cheap, no frills transportation, but come on, if it takes me 100 miles to figure out how to tune the radio or turn OFF the radio, then either I'm a hobgoblin with mental issues or the radio is just not user-friendly. Please humor me and agree that the radio wasn't user friendly, because I'd hate to be a hobgoblin with issues, even this close to Halloween. Audio controls should make it easy to tweak the bass and treble, and just maybe the mid-range. It should NOT have generic setting for "talk radio" and "music", with no other easily used audio settings. Why not just go with "1960s AM Radio Quality" and "Recycled Tin Can With String Quality" instead, because that's about what it sounded like to me. 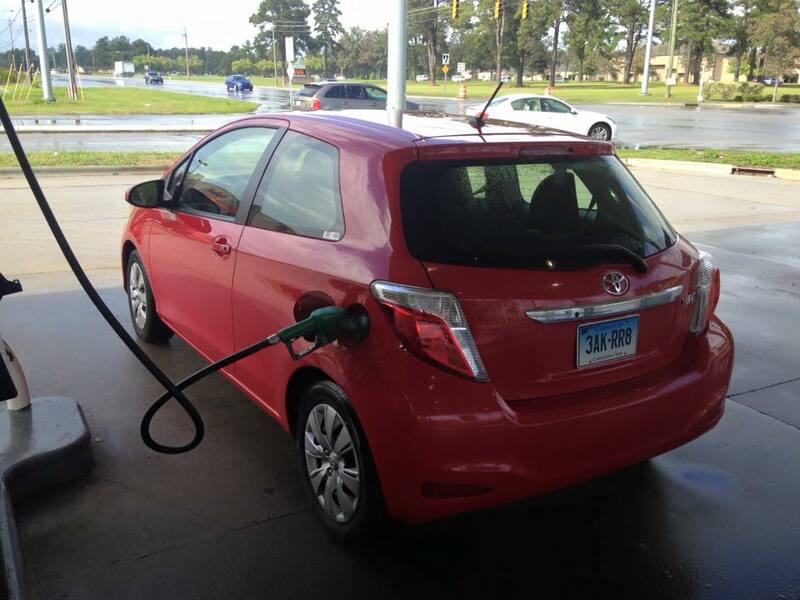 I'm just a professional musician, so don't take my word for it; go rent a Yaris and check out the audio for yourself. 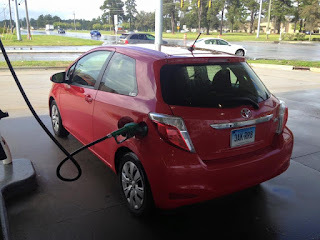 Believe it or not, while it's easy for me to list these issues with the Yaris, it felt pretty solid on the road, and quite a bit of the driving was in rain. Yes, once or twice a light came on to indicate that some kind of traction control was helping with the aqua-planning, but even without the rain the car was fine to drive on the highway, and really did a good job of getting down the road. Well, getting down the road as long as you don't need to accelerate very fast, but it was OK. Seating comfort wise, the Yaris would not be my choice for anything more than around town, but again keep in mind this has to be about the cheapest car in the universe. Or at least in the US. Or from the rental lot that my employer let me use since we have to use the cheapest car. 400 miles at a shot left me wanting better seats. Another trivial matter that I noticed in the rain is that the front windshield wiper has just one blade that covers the front for both driver and passenger. It worked OK, just unusual with one central blade. The rear window also had a wiper, so while that was nice to have in the spray, the half circle it cleared on the glass was off-center to where the driver looks with the rear mirror centered. I'll mark the rear wiper as "needs improvement" and further solve this issue by never driving a Yaris again. Final summary: If you can afford a new car, yes the Toyota Yaris meets that description, but I think you'd be happier with a gently used car in the same price range that offers more features and comfort. Toyota makes good cars in all segments, so I'm thinking a 3 year old Corolla or Camry could beat the Yaris in every department at about the same price.